View My Water Report - It's Fast, Free, and EASY! : VIEW MY WATER REPORT! Welcome to ViewMyWaterReport.com! My name is Ualani, which means Heavenly Rain in Hawaiian. I've felt a strong calling to work with water lately, and since I have learned so may surprising facts about water (the good, the bad and the ugly) I felt it was important to make this blog to share what I know. I did not realize, until recently, how many toxins (that are considered a threat to our health) really ARE in our water. I will continue to post more as I discover new things. The Ugly Truth about Bottled Water! San Francisco Regional Water - Have a Look! Hexavalent Chromium (the chemical in the movie "Erin Brockovich")...is WAY more common (and toxic) than you may realize! View a List of Hexavalent Chromium Levels in Different California Cities! Radon: Just ONE atom can trigger Lung Cancer! Just CLICK HERE to learn what's been in your water! 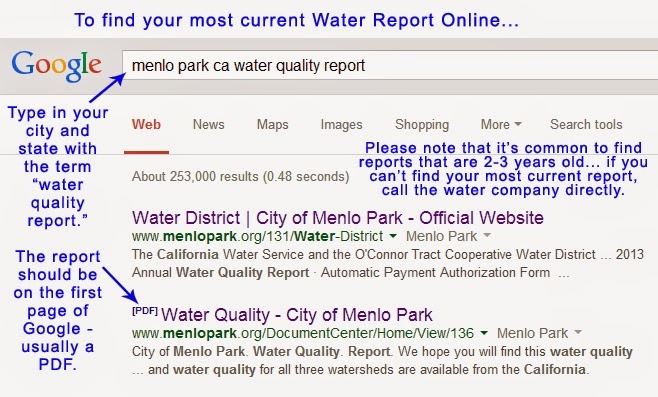 When you get to the website, type in your Zip Code or Water Company (just a zip code will work). A list of water companies in your area will pop up. Just pick your company from the list. Please not that the EWG database will show you information for what was in the water during their reporting period (in most cases, this is for the years 2004-2009, but in some cases it's 2004-2007 or 2008). They are a nonprofit so they can't offer reports for every single year. However this is an invaluable resource because it will give you some insight as to what has been in your water (and what could still be in it today). I've seen them list toxins that could not be found on a basic water report. it's not usually found on a basic water quality report. 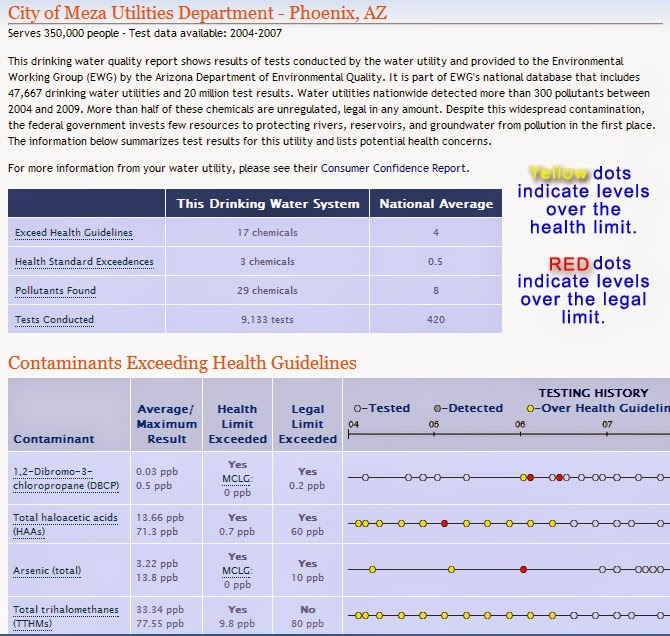 So it will be to your advantage to check BOTH EWG's site and your company's most current water report online. You can also check the quality of your own water by sending a sample to a water tester. If you need a good resource for someone who can do this, email me. I know a guy who's been doing it for over 20 years and he can give a good discount to buy water filters from him. I'm going to see if he will let me create a blog page for him and his services. When you are in EWG's database, you will see many toxins listed. Please note that I am not affiliated with the Environmental Working Group, but they are a great resource and as you can see, I am a big fan. To learn more about EWG, please watch the videos below. These folks do so much to educate the American Public about toxins in our environment. They make it pretty clear why you SHOULD be concerned about what's in your water (and air, and food, and household products), and stop looking the other way (as I did, for most of my life). I encourage you to visit their site and learn more about them, like them on Facebook, and spread the word. This is a very powerful and inspirational video that will show you why you should care about the toxins in your environment! I get goosebumps every time I see it. It's also pretty funny at times. Thank you to Ken Cook and all the hard-working people at EWG, for all you do to help us! To see easy ways you can donate to EWG, including simply shopping on Amazon.com through their Amazon Smile Program, CLICK HERE. Please note it will NOT cost you any money to donate through the Amazon Smile program. as the charity you want to donate to. Thanks for checking out View My Water Report.